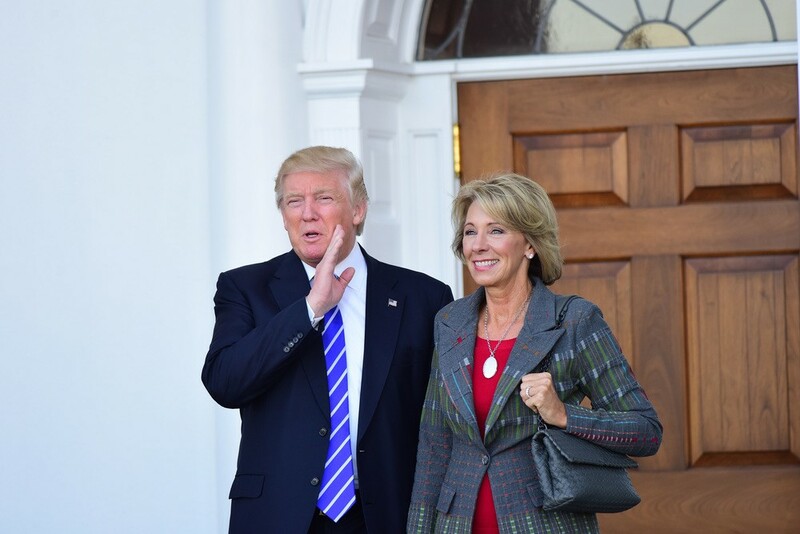 President-elect Donald Trump with Betsy DeVos, whom Trump has chosen as his secretary of education, on Saturday, Nov. 19, 2016 in Bedminster, N.J.
Redirects education dollars to give parents the right to send their kid to the public, private, charter, magnet, religious or home school of their choice. Ends common core, brings education supervision to local communities. It expands vocational and technical education, and make 2 and 4-year college more affordable. While Trump’s administration has not yet released specific details of the plan, on Wednesday he announced philanthropist Betsy DeVos as the next U.S. Secretary of Education. The appointment of DeVos, who is a long-time champion of educational choice and opportunity, entrusts education reformers with an historic opportunity to improve America’s educational system. Trump admirably desires to fund students and not schools. The best way to ensure that federal education dollars follow students, rather than being directed to brick-and-mortar institutions, is to allow federal Title I dollars to flow to whatever school parents choose for their children and to offer educational choice in areas already under the authority of the federal government. The recent rewrite of the Bush-era No Child Left Behind, known as the Every Student Succeeds Act (ESSA), missed an opportunity that Trump’s administration should seize: permit Title I funding portability. Amending ESSA to include a provision for Title I portability would means that the federal education dollars that states receive would be spent on the school of a student’s choice, and not only at a traditional public schools. Allowing parents to allocate federal dollars to the school that best meets their children’s needs aligns perfectly with the administration’s stated goals. Furthermore, Trump can provide educational choice to families living in Washington, D.C., service men and women living on U.S. military bases, and individuals residing on Native American reservations. The Trump administration should implement or expand successful choice programs in these areas—like Education Savings Accounts (ESAs),which unbundle education by allowing parents to spend their child’s education dollars on private school tuition, homeschool curriculum, online courses, tutoring, and more so that students can enjoy a truly customized education. Trump could also expand student eligibility for effective programs like Washington D.C.’s Opportunity Scholarships Program (DCOSP), or even transform DCOSP into an ESA to make it more flexible for participating families. Trump’s goals to end Common Core and bring education supervision to local communities can be effectively achieved by simply allowing Common Core to fizzle out on its own. Common Core’s political death is imminent because state officials—who took federal dollars in exchange for its implementation—have received such fervent constituent backlash. By taking such inaction, President Trump can “end” the Core, likely over a period of a few years, while respecting local autonomy. There is no need for the federal government to do much beyond rescinding any ESSA regulations that incentivize states to keep Common Core in place. By allowing Common Core to fizzle out on its own while nixing ESSA incentives for states to keep a standardized curriculum, Trump will empower states to reclaim their standard making authority. With Betsy DeVos as Secretary of Education, Trump’s goals of improving the affordability of college and expanding the availability of vocational and technical education are imminently achievable. According to Trump’s website, his policy priorities are to ensure postsecondary institutions are actively reducing tuition costs and student debt, while also ensuring that technical schools are more easily accessible. These priorities demonstrate an understanding of the problems in higher education. As a starting point, colleges do not have enough vested interest in seeing their students succeed because they get paid through tuition whether or not their students graduate with a job—or even graduate at all. For the same reason—because colleges receive tuition fees either way—there is no incentive for colleges to reduce or keep tuition and fees low. Moreover, federal student loans—which make up approximately 93 percent of all student loans given—do not inquire into the likelihood of the borrower to repay or the extent to which their educational path of choice will result in employment. By phasing out federally subsidized education loans—such as the Plus Loan programs, which encourage family-level debt—Trump could create a space for private sector options to enter the market. Private sector alternatives are superior to the status quo because they shift the risk from the government and student to the investor, who therefore have a vested interest in seeing students succeed if they have any hope of repayment. One example of this is Income Share Agreements (ISAs), where private lenders front loans and are repaid as a proportion of the student’s earnings upon employment for a previously defined period of time. This aligns incentives for the private lender to see the student succeed while also freeing students from intractable debt, as students will never be obligated to pay more than a set percentage of their income. Trump could also improve upon the way that federal funding is tied to requirements that colleges accurately report information. Graduation rates, post-graduation employment information, and the financial rate of return on certain majors and degrees are all important factors. There are two main weaknesses with the status quo. Firstly, information currently included in the Department of Education’s College Scorecard are those that accept federally funded student loans, which there by excludes information about first-rate private institutions that do not, such as Hillsdale College. Secondly, there is no consideration of the make-up of the student body—ethnically or about thereby making it difficult to isolate the impact a school has on a student’s outcome. Improving the way that the U.S. Department of Education collects and uses institution information would allow parents and students to consider a variety of important factors when deciding to take on debt to attend a given school. Trump’s approach to expanding vocational and technical training should, at a minimum, include the following three actions. Firstly, he should use the presidential bully pulpit to counteract the negative stigma surrounding blue-collar work by disabusing the assumption that a four-year-college degree is the only path to success. Secondly, he can send strong messages to states to reform accreditation and licensing requirements to allow tradespeople to teach their trade without jumping through numerous regulatory hoops or having to go back to school for a degree in teaching. Lastly, he can help make vocational and technical training more available by offering federal tax credits in exchange for technical institutions making educational opportunities available to secondary students, such as Massachusetts Institute of Technology’s FabLabs initiative. MIT’s FabLabs for America partner with local schools to develop factories and labs that expose students to science and technology opportunities from an early age. A recent report by the Cato Institute suggests taking ideas from the German apprenticeship model to encourage apprenticeships in vocational occupations—which are available for hundreds of vocations and include on-site training as well as time in the classroom—as an alternative to traditional college degrees. This type of innovative thinking—through public-private partnerships and looking to what policies are working for other countries—can support students in securing opportunities for technical and vocational training. Policymakers who share Trump’s vision of student-centered reform should be excited to seize the opportunity this administration offers. President Ronald Reagan famously quipped, “The most terrifying words in the English language are: ‘I’m from the government and I’m here to help. '” It would be fitting for Trump, in addition to the DeVos Department of Education, to take to heart these wise words of the man he oft-invokes, especially when it comes to his education policy platform: less is more. Alexandra Hudson is a graduate of the London School of Economics, where she completed her Masters in International Comparative Social Policy as a Rotary Global Grant Scholar, and has held posts with the American Enterprise Institute, the Federalist Society for Law & Policy Studies, and most recently as Lead Education Policy Analyst at the Wisconsin Institute for Law & Liberty.